Hiroko Kawata, a tour guide with the nonprofit organization Japan for Sustainability, covers her microphone with her hand and whisper-rehearses a section from her handwritten notes, running over a few words and the trickier English phrases. She nods to Julie Emmings, her British companion, who unfurls an orange bandanna attached to a branch, thrusts it in the air and waves a signal to get going. And we’re off, into the wilds of the 11th Eco-Products Exhibition at Tokyo Big Sight in Koto Ward. Considering the fact that there were a total of 721 companies and organizations represented at this year’s show, we were thankful for the guidance provided by Japan for Sustainability. Over three days, the fair was visited by 182,510 people — around 8,500 more than last year. 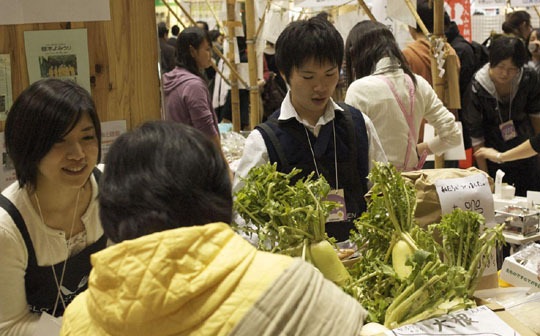 Companies ranged from Japanese giants such as Toyota, Panasonic, Mitsubishi, Mizuho, Meiji and Sapporo to one-person booths manned by entrepreneurs eager to showcase their wares. Among the big corporates, Sanyo Electric Co, Ltd. showed off what $100 billion can buy in research and development: a giant solar-panel disc, capable of charging electric cars. But the company also focused on smaller projects such as the “eneloop” bicycle. Though it is yet to go into production, Sanyo already envisions the bicycle being a part of everyday life, where it can be docked and recharged at bicycle stands equipped with solar-paneled roofs. Thinking even smaller, the company also introduced solar-panel cell-phone rechargers, which give 20 to 40 minutes of talking time for every hour of charging. Smaller companies as well proved that it only takes great ideas to produce winning eco-products. There were a number of creative methods of using alternative energy resources on show, especially conversions of byproducts and waste into fuel. Sakai Sangyo Corp. provided a simple but logical solution to deforestation in Japan: the recycling of dead wood into biofuel. It collects forest underbrush and factory wood-waste and converts it into pellets that can be used in grills and stove heaters. Although burning wood releases carbon dioxide, the pellets are carbon neutral. They also release very little smoke compared to other burnable fuels. The company even encourages users to recycle the ash as a garden fertilizer, leaving nothing to waste. 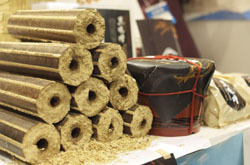 In a similar manner, rice farm Tomosa illustrated how it is recycling the discarded husks from their harvests into “bio-silica” firewood that can burn for three hours. The highly dense fuel source is, like the biofuel pellets, carbon neutral, and likewise, the ash waste can be re-recycled as fertilizer. Perhaps the most creative form of generating energy from recycling came from Super Faiths Inc., which proposes a scheme it says will expand with the graying population. Off-putting as it may sound, it proposes creating a municipal system to collect used disposable diapers, including the increasing number of adult diapers, and turning them into fuel. Such diapers are currently burned or buried in landfill, disposal methods that either create CO2 or are in danger of releasing hazardous substances and other pollution. By creating pellets from diapers using machines produced by Hino Pile Co., Ltd., Super Faiths say that it can reduce CO2 emissions as well as reduce labor loads and costs. The pellets, which are bacteria-free, can be burned in biomass boilers or heating systems and, you’ll be relieved to hear, they’re odorless. Smells, though, did appear to be a bit of a theme at the fair. Ito-en Ltd., the beverages giant and largest green-tea producer-distributor in Japan, is recycling used tea leaves into all manner of products — from plastic bags to the core of tatami mats. 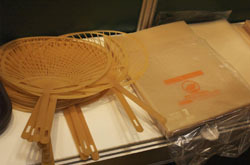 Visitors to the show were given pale-green plastic bags that gave off the aroma of green tea. Similarly, bags handed out by Biomass Technology representatives had the faint aroma of rice. Biomass Technology makes use of rice from Japan’s much-criticized stockpiled reserve, which has been stored beyond safe human consumption. By making it a main component for its plastics, the company creates reusable products such as shopping bags, folders and fans. For Ito-en, green tea has the added advantage of being a natural deodorizer. Used-tea pulp, which is easily compacted into a solid form, is therefore also useful for products such as shoe insoles. And if it’s not your feet that need a little help, Amadam Inc. takes advantage of another natural deodorizer: bamboo. Amadam’s range of bamboo-fabric clothing and towels are as soft as cotton and as warm as wool. According to the representative, bamboo has anti-bacterial properties, produces no static and is effective at blocking UV rays. It can also be grown with almost no agrochemicals, making it an eco-friendly resource. 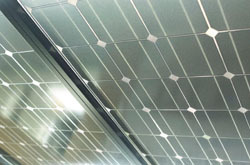 Most of the products featured on the Japan for Sustainability tour were those designed for everyday use, including small domestic items, such as nonelectric humidifiers, as well as major technological advances, such as WinPro’s hybrid street-light system, which combines wind and solar energy to create an independent power supply. The Eco-Products Exhibition itself was clearly planned to be as green as possible. Exhibitors’ booths could only be constructed out of six approved materials, needle-punch carpets of recycled polyester were used throughout the site and 11 categories for trash recycling were divided within the site. Visitors were even allowed to bring trash from home, such as clothes, cell phones and cooking oil, for onsite recycling. In addition, the electricity used (an estimated 140,000 kWh) for the show was all fueled by renewable energy sources — wind, biomass and photovoltaic generation. Despite the organizers’ best intentions, however, a surprisingly large amount of leaflets were being passed out to the nearly 200,000 visitors, not to mention “eco-bags” being distributed by larger companies. Overall, though, this served as a lesson in the difficulty of being eco-friendly. It’s one thing to admire companies’ green initiatives but quite another to be a green consumer. Let’s hope that those who picked up several bags were inspired to reuse them many, many times.